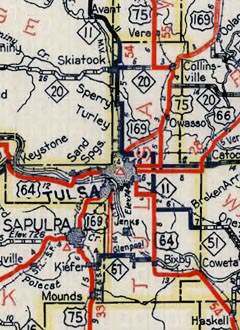 1934 was also the first map to show State Trunk Highway 169 signed along a previously-unmarked road running northeast from US 53 at Virginia, through Franklin and Florenton to Peyla (near Tower). In other words, the number of this new trunk highway was obviously based on US 169, and apparently its mileposts have always been numbered as if the route were an extension of US 169. But the map from the following year (1935) showed that TH 169 had been rerouted to its current corridor. In other words, traffic no longer went through Franklin, but instead connected to US 53 about four miles north of Virginia (at what I refer to as "Ely Junction", pronounced EE-lee). 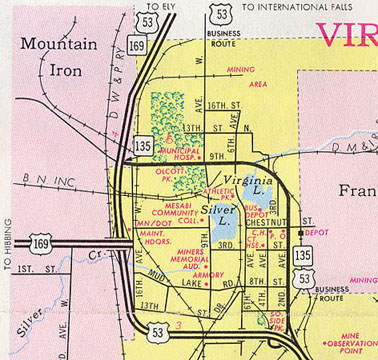 So now, in order to maintain route continuity between US 169 and TH 169, it became desirable to add the 169 designation to the four-mile segment of US 53 north of Virginia. But was it considered US 169 or TH 169? 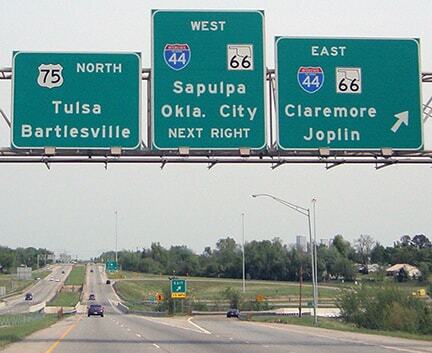 So in 1950, were the US 169 signs removed north of Virginia, and replaced with TH 169 signs? That is possible... and if so, then the north endpoint of US 169 reverted to the intersection described above. 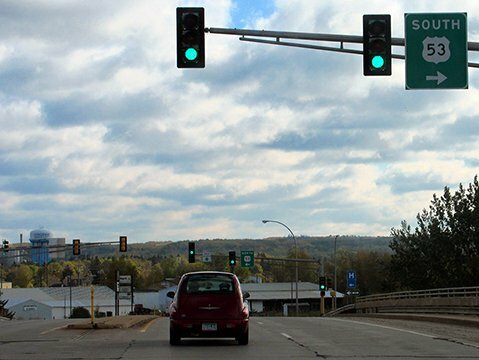 But it is also possible that MNDoT continued to sign the four-mile segment up to Ely Jct. as US 169 (more on that later). 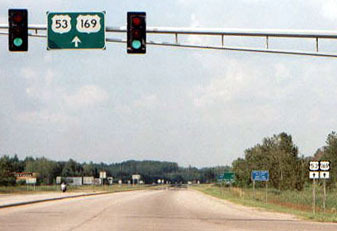 Originally US 169 extended right to old US 53, but after that bypass was built, the north beginning of US 169 was to the left. But that situation lasted only a few years, because in 1971 the US 169 expressway was completed west of Virginia, and thus the modern highway configuration in the area was established. So the north end of US 169 was changed to its current junction with US 53. Presumably AASHO (and later AASHTO) always considered the aforementioned endpoints to be correct. 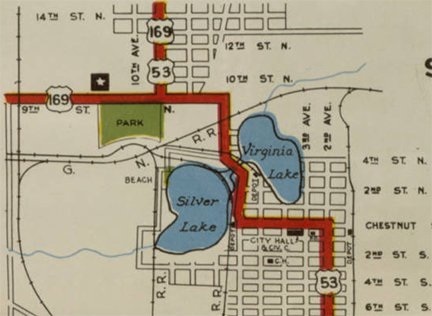 However, despite the fact that MNDoT maps after 1949 marked the Virginia-Ely Jct. segment as TH 169, there is reason to believe that they actually signed that stretch as US 169. That was certainly the case as late as 2000 (as shown in several photos below). 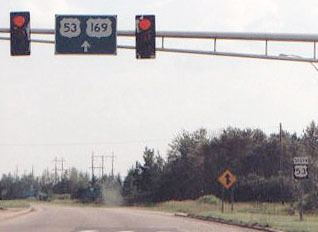 It was not until about 2005 that MNDoT removed the US 169 signs north of Virginia. And whereas, heading north from there today, the road is signed only as US 53, it used to be that US 169 was dual-signed with US 53. 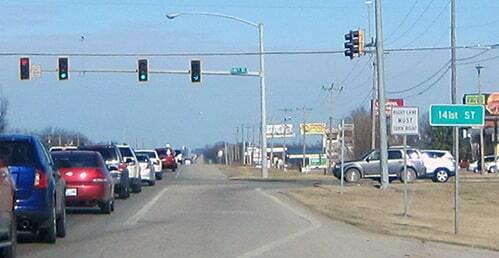 So to summarize: since 1934, the north end of US 169 has officially been at its junction with US 53 in Virginia. But for at least part (and possibly all) of the next 70-year period, the signed endpoint of US 169 was four miles north of Virginia. 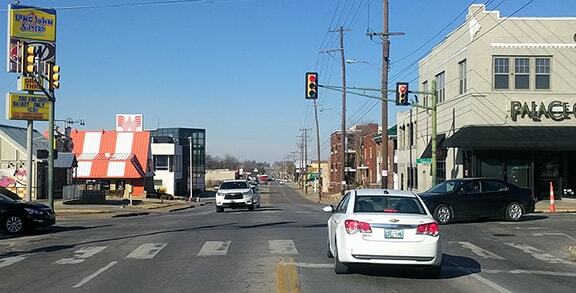 The two black cars (at left and right) were on 15th, which historically carried US 64 traffic. Straight ahead on Peoria was the south beginning of US 169. According to the legend for that map, US routes are shown in red, and state routes are blue. 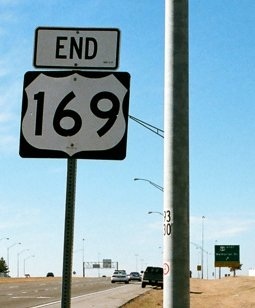 So US 169 is shown ending at OK hwy. 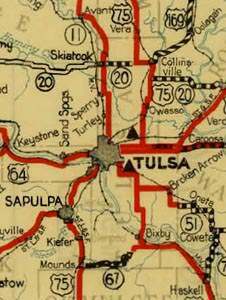 67 in Glenpool, rather than being signed westward to a terminus at US 75 in Kiefer (the "hollow" red line indicates that the road was not yet paved). That was confirmed in the legal description, which specifies US 169 was extended to "Jct. SH 67 near Glenpool". But note that, while today's OK 67 runs along 151st Street, that was not the case until about 1972. Prior to that, OK 67 ran along 141st Street, so that was where US 169 ended. One from 1958 indicates their understanding was that AASHO actually approved the extension contingent upon having the route improved to primary standards. 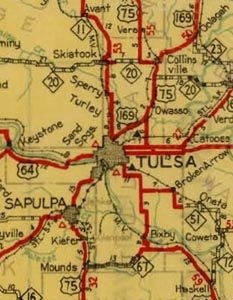 ...a 1965 document instructs staff to remove US 169 signs between Tulsa and Henryetta. 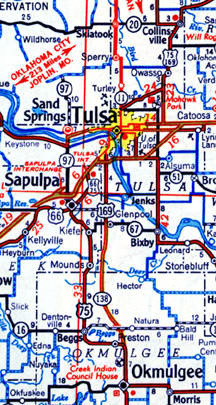 In 1978, US 169 was truncated again, such that it ended on the Mingo at its interchange with I-44. 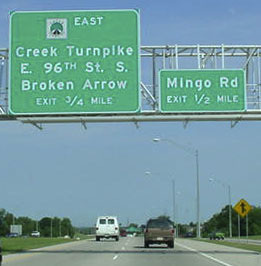 This was probably done because the next segment of the Mingo was about to open, and OK DoT had decided to use the US 169 designation for the Mingo. That happened in 1981, when the Mingo was completed down to the Broken Arrow Expwy, and US 169 was extended to that interchange. In 1987 the Mingo and US 169 were extended to the 71st Street interchange. 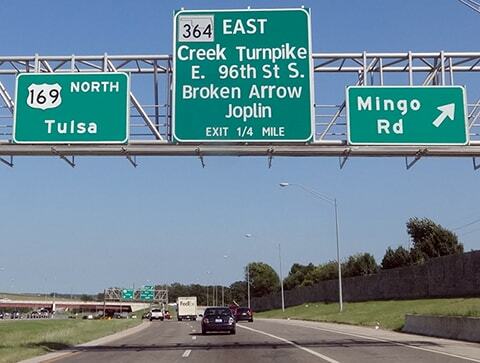 By 1991 the Creek Turnpike was complete between Okmulgee and Memorial Drive (US 64), but the Mingo still went only as far as 71st until the following year: in 1992 the Creek Tpk was connected with the Mingo, and that is when the US 169 designation was extended to its current terminus at Memorial. 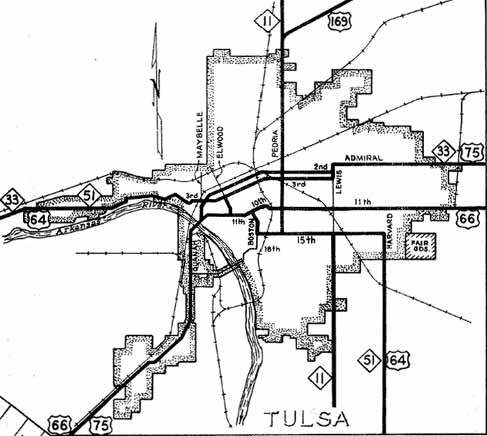 This link goes to an interactive map showing current and historic endpoints in the Tulsa area.